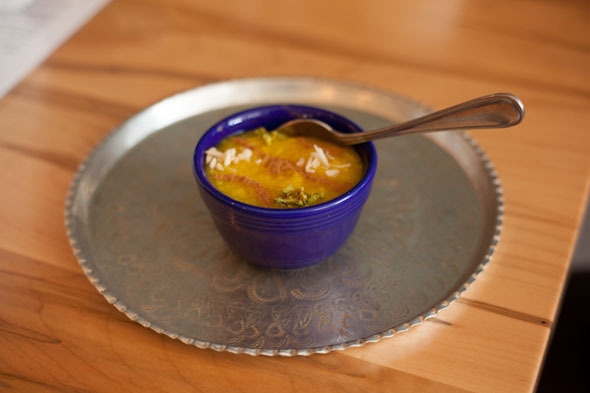 Takht-e Tavoos unveiled their vibrant menu this April, on a quiet stretch of College West near Dufferin Grove relatively slim on eating selection. But with Bar Isabel and The Caledonian by Dovercourt, the nearby Tat Burger , Arabesque , and the newly-spry Senisi Fine Foods west of Gladstone, it's no doubt that food culture in this area has been peacocking as of late, earning not just a few feathers for its keep. 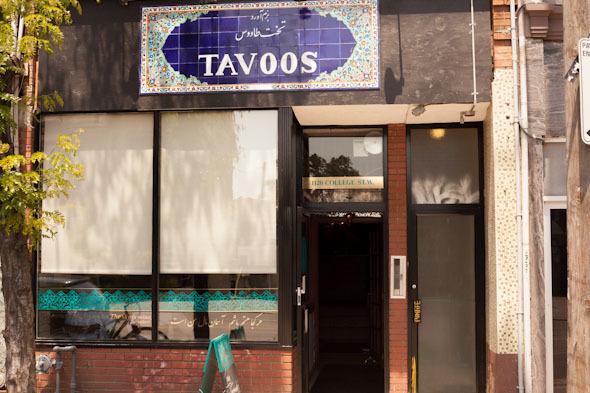 Regulars of Persian cuisine in the city won't be surprised to find out Tavoos is the second lovechild of Pomegranate , the first being Sheherzade . Living up to their namesake, the decor of Takht-e Tavoos, which translates as "Peacock Throne," displays all the crisp and lively turquoises, walnut-golds, amethysts, moonstone greens, and royal blues that adorn a peacock crest--enough pigments to make a J. Crew colour chart blush. 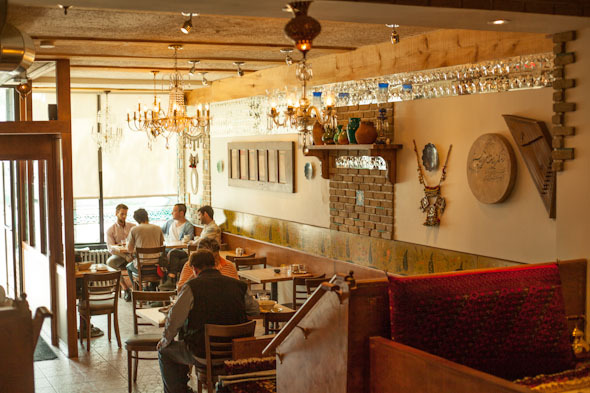 A commissioned tapestry-like mural of Iran-native cedars encloses the dining area, flanked above by tasteful ceramic vases, art, paintings, lanterns, and a lustre of stone tiles in places, brick and wood panels elsewhere. But for a more customary Persian experience, the obvious highlight is the inclusion of two "takht" rug seating areas. Currently Tavoos is a strict lunch and brunch affair. No date yet has been set for serving dinner, but word is any day now. So expect some menu alterations, but thus far the results seem promising for either the classic Persian or modern fusion options. This time I went the former, but next time I'll opt for brunch. The spinach narguesi ($9.95), for instance, gets you two eggs your style perched atop a bed of sauteed spinach, matched with creamy feta cheese, olive marinade, grape tomatoes, and spiced potatoes. Plus all brunches come with a house salad, a hot batch of barbari-style flatbread, and choice of beverage. In any case, make sure you try their house chai at least once. 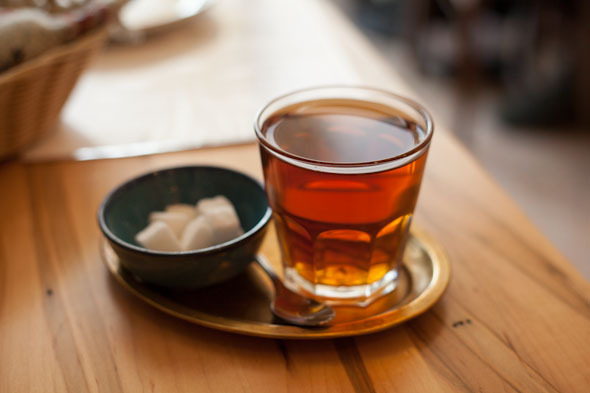 Some of the most pleasant tasting I've yet tried, their chai is steeped to excellence in the eye-catching samovar at the counter. Otherwise, given how inexpensive and generously sized the appetizers are, the sheer fan of flavour combinations will encourage many a group outing. You've got their artichoke borani, a dish of sautĂŠed artichoke mixed in an herbal yogurt blend ($3.95), and their Tavoos Jewelled Salad, mixed greens "bejewelled" with feta, sunflower and nigella seeds, and Iranian barberries known as zereshk ($7.50). Absolutely lovely though is their zeitoon parvadeh ($4.50), which is as rich as salads come: green olives marinated in purĂŠed walnut sauce, pomegranate molasses, and scored by a twang of garlic and mint. Totally bright and salty-rich, with a side of their airy flatbread, this is the perfect summertime snack to bring away in a lunchbox, perhaps to the shady refuge of the nearby grove. And typically they have baklava, but as they were sold out I tried the dessert of the day, sholeh zard, a Persian saffron rice pudding, dusted with chopped pistachios and cinnamon. But I digress: my main course this visit was the kalleh pacheh ($13.95), a stew which may intimidate even the more gutsy carnivore. This house specialty's broth draws its bold flavours from sheep tongue and hooves, while lemon juice, cinnamon, and chillies cut some of the gamey aroma and flavour. To cleanse the palate, too, I'd munch on pickled garlic or parsley. 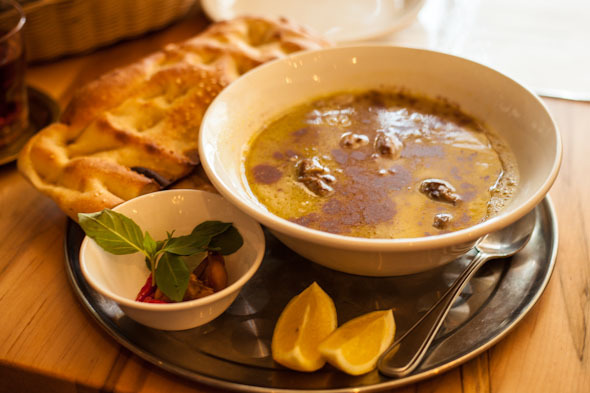 Rather than simply dip, I followed the recommendation from their exceedingly friendly and carefully informed staff to soak chunks of flatbread in the soup. Usually the bread I use in Western stews ends up soggy goo, but this doughy morsel indeed still had some satisfying bite to it. Apart from its infusing qualities, I felt there was little payoff from the hooves, which were almost exclusively fatty. The tongue on the other hand was much leaner and packed with deep flavour. I ate it with a fork and knife on a side plate, and the pieces fell apart easily, fibrous without being too stringy. Texturally, it reminded me of oxtail stew, in a way. Still, the jutting, unmistakable tongue-shapes may explain the dish's limited appeal to those unfamiliar with Persian cuisine. Curious onlookers, two Iranian men from the States, New York and Minnesota, respectively, looked on as I ate the prized dish. They were quite pleased that not only did I give the course a chance, but furthermore that I savoured it. That's when I learned that Toronto, due to its large Persian community had been given the endeared term "Tehran-to." Much easier on the tongue, I thought, than its more awkward American counterpart, "Los Tehrangeles."